Following recent rumors that its beloved seasonal beverage would soon be making its annual return to stores, Starbucks announced on Tuesday that the Pumpkin Spice Latte will officially be available once again, starting Tuesday, August 28. So, dust off your North Face fleece jackets, prep your taste buds, and embrace your "basic"-ness, because PSL season is upon us. In addition to marking the unofficial start to fall, the sweet and spicy caffeinated drink's return this time around is particularly significant, because this is its 15th consecutive year on the menu. In other words, it's nearly old enough to get its driving permit, drive itself to a local Starbucks, and order a grande itself. Earlier this summer, Starbucks got the PSL buzz swirling when it launched a private Facebook group called The Leaf Rakers Society where fans of fall (and PSLs) could go to discuss their love for the season and the drink that's become so associated with it. Discussions there quickly shifted to focus on when exactly the specialty beverage would be coming back, with members pointing to Reddit posts from Starbucks baristas who were sharing photos of PSL ingredients arriving back in stores. If previous years are any indication, Starbucks will likely also be unveiling at least one other fall-themed beverage in the coming weeks, so if PSLs aren't your thing, you'll probably have other options to choose from when it comes to getting your seasonal caffeine fix. 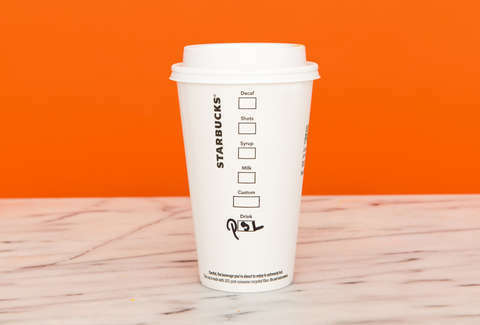 Speaking of previous years, Starbucks brought back the PSL on September 5 in 2017, which means it's returning to stores a little more than a week earlier in 2018. That said, if you simply can't wait a week until you can strut into your local Starbucks and order a true Pumpkin Spice Latte from a barista, there are a number of official PSL products like K-Cup pods and bottled versions already available on grocery store shelves.